I've noticed that I've had little ant congregations on the bottoms of my cuke leaves. Well, today I noticed these little yellow specks--they don't seem to move. It almost looks to me as if the ants are collecting the specks? I tried my best to take a few good close ups. What are these yellow things and how can I organically get rid of them, if necessary? Yes they are aphids. 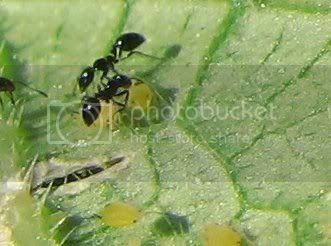 The ants 'farm' them by moving them about the plants to new growth where they milk them for the sweet sticky excretions they provide. You can spray them with insecticidal soap and/or whiteoil, or a number of other sprays like garlic/chilli sprays.. These may also damage populations of ladybeetles and other predators which feed on the aphids. Alternatively, you can line the trunk of the plant with something which stops the ants from climbing up the plant. A bit difficult on cucumbers methinks. (Those green pot scourers wrapped around the trunk are supposed to work for this). Then allow beneficial insects to take care of the aphids. You can assist them by squishing them with your fingers or blasting them off with a jet from the hose. Ensure your plants receive potash in their fertilizer to help toughen new growth quickly. It also helps with fruit forming. High nitrogen ferts can cause lots of lush leafy growth which is a perfect situation for these pests. The secret is the soil. And here I was, thinking that the ants were eating the aphids! But they are actually helping them thrive! No fair. I've got lots of ladybugs hanging around in my corn but I frequently see them crawling around my cukes... I guess that was my first sign of a problem, huh? I'm thinking of just trashing the plants anyway because the cukes are practically inedible. I've never even fertilized over there and I'm watering them like crazy, so I'm sure what is making them taste so bad... Will the aphids go elsewhere if I just toss the plants in a compost pile or will they just hibernate somewhere and return next year? Thanks! i'll be honest sarah. . ihad aphids for a few days on my plants and didnt seem to hurt them at all. You can compost the cucumbers. It'd probably be best if you bury them under some grass clippings or something but i don't think hibernation etc is a problem. It's the eggs which last thru winter but in a composter the heat will kill them off anyways. Longy, that makes sense when you think about it. Everything in the compost pile is going to be broken down anyway.